A quick tweet can blast through Twitter like wildfire. All it takes is a click of a button and anyone can help push that 140 character shout just a little further through cyberspace, until everybody knows. This is what it looks like when that happens. "Where Does My Tweet Go" is a neat little Twitter analytics tool developed by France's MFG Labs. 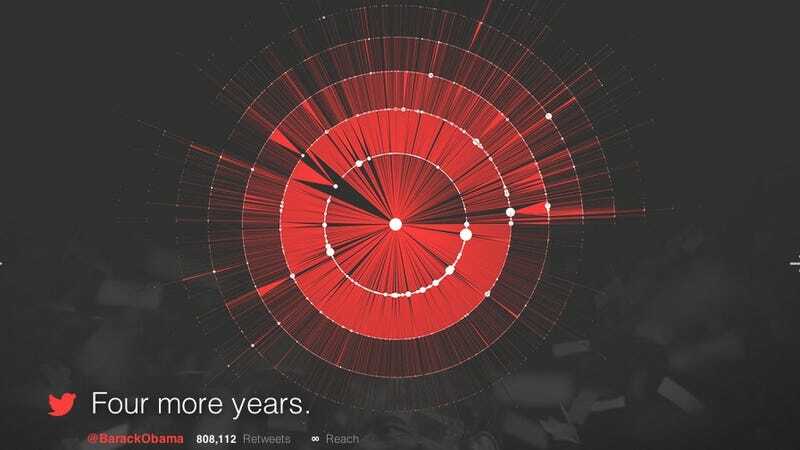 It's a very simple concept; instead of just telling you how many times one of your tweets (or someone else's) got retweeted, it traces the viral spread from person to person to person, ever outward to Twitter's furthest reaches. Each graph starts with a dot in the center for the original tweet, with a ring around it for the first wave of retweets. Each concentric circle represents yet another wave, like ripples in a pond, while the pie-slices emanating from each tweet show the overall reach of every echo.